Many people buy books but never read them, or never read them completely. You are not many people. You are you. I'd really like you to read my book and change your life. And then change the life of everyone you meet. 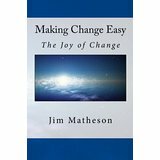 Could reading my book MakingChange Easy change your life? When you have read it, I hope you pass it on to someone else to read it rather than let it collect dust on your bookshelf. If you like the book and want to share your thoughts about it with me, contact me.